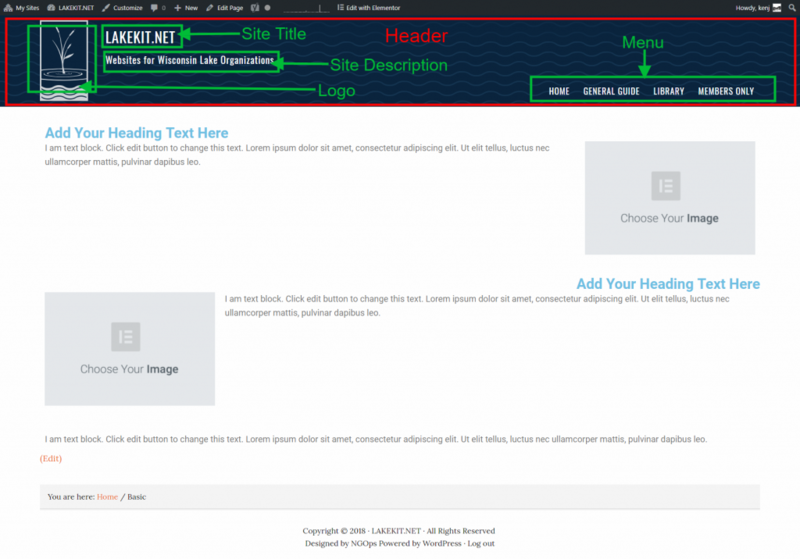 The theme we are using on Lakekit.net is designed so that the header stays in place and the content scrolls up behind it as the user reads the content. This way the menu and header art is always available to the user. As the size of the screen gets smaller due to device used the header becomes part of the site page and just scrolls up along with the rest of the page. The header section is made up of a posible background image or a solid color, a logo, Site title, Site description and a menu area. All these elements are controlled through the customizer in the admin panel called the dashboard. The Lakekit.net site uses an image for it’s background that has a repeating pattern that is supposed to look like waves. It’s a simple, muted and purposely designed element meant to tie into the fact that Lakekit.net is part of a lakes organization and that focuses on water and water conservation. You can use any image you create or have created for you as your background image that is created in an acceptable format. Any image that can be uploaded into your media library can be used. Please format your image at 72ppi so as to be the smallest possible size for the purpose of speed. Also please make sure you own the right to use any images you may be using on your site. For best results please upload a background image that is 190 pixels high by 1100 pixels wide. You can use any image you create or have created for you as your logo that is created in an acceptable format. Any image loaded up into your media library can be used. Please format your image at 72ppi so as to be the smallest possible size for the purpose of speed. Also please make sure you own the right to use any images you may be using on your site. For best results please upload a image that is no larger than 160 pixels high for your logo. Your site title is what your site is referred to. We could have titled our site Lake Kit but as we want people to know us as Lakekit.net we title our site as such. Your site description is your site’s tagline. A tagline is just a short statement you want people to walk away with and remember. Your site don’t need to has a site description but having one does help people understand the goal and intent of the site along with helping them remember your site later on. Your site menu is how you navigate your site . The menu is created, organized and controlled using the customizer in the backend dashboard of the site. While menus can be stacked please make a concerted effort to limit the menu item to 3 levels deep. You don’t want users having to navigate to deeply to find the information they are looking for.